This book talks about getting people to transform their "if only" attitudes with "What if" possibilities. 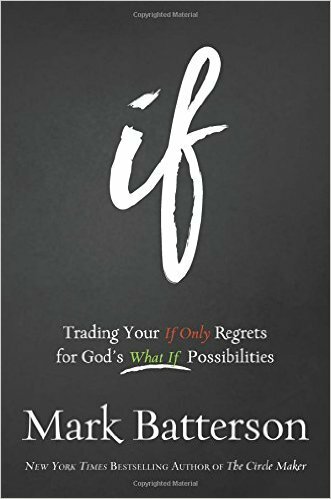 The author talks about how he tries to live his life in the "what if" category - always looking for new opportunities around every corner. He talks about overcoming doubt, guilt and fear to live the life God intended for you. 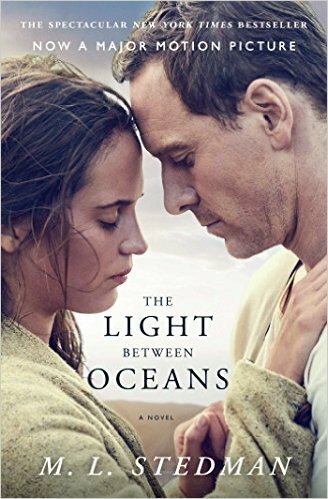 I am not very religious, but I enjoyed most of this book. Were there a few moments where I rolled my eyes? Yes. Do I think much of pastors that have "super churches"? Not usually. Of course, the book was from the point of view of the author, but honestly, he didn't seem much like the usual super church pastors. He gives millions to missions and charity work. He lives in a comfortable townhouse and owns a car with 200,000 miles on it. So maybe (maybe) in this case - he is not the typical TV pastor we all come to dislike. I did agree with many of the points he tried to make. How we should be living a life taking chances and making the best of any situation. I think it was a good read, and while I felt like there were many passages where he rambled and said the same thing several times in a row, the main idea was clear. 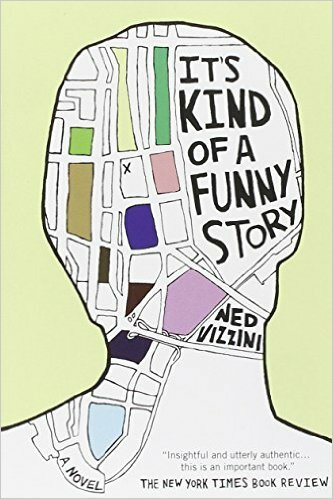 This is the story of Craig Gilner who is a teenager in a high profile high school in New York City. He worked very hard to get into a Pre-Professional High School to keep him on track to get into a good college. The stress starts to take it's toll, and Craig starts to consider killing himself. He hasn't been able to sleep or eat well in weeks, and really feels like he is spiraling out of control. He makes a plan one night that the next day he will kill himself. But instead, he called the suicide hotline and gets himself to the emergency room a few blocks away. He is admitted to the hospital's psych ward for an inpatient 5 day stay. During that stay he learns a lot about himself, his friends, and others with mental illness. This book was fine. I understood where it was coming from, and I liked its message. I liked that the main character decided to seek help and not commit suicide. And that he was able to pull himself out of his lowest low and start working toward healing. What I DIDN'T like was how "hunky dory" they made his 5 day stay on a mental ward. He made friends and fell for a girl. It seemed to stray from the point of the story. He was there to heal and get better (a theme his doctors continued to preach throughout the book, yet he ignored). He was there 5 days and the relationships he developed were as if he was there for years. They just didn't make sense. Maybe it was because the main character was a teenager, and this was a teenager mentality - that it wouldn't only take 5 days to latch on to "others like you". But I think the story was a bit too "happy" to be realistic. This was a kid who was committing suicide. Had a lot of problems - from not being able to eat, to not sleeping, to not taking his medication. No way in 5 days did he basically become 100% better. Anyway - judge for yourself. Like I said - the message was there. It was just hidden under fluff. 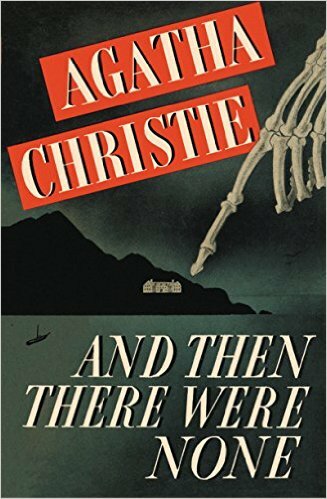 This is an Agatha Christie classic about a group of 10 people lured to Indian Island by an various pretext. Once they are gathered in the house, they are prompted to listen to a gramaphone recording in which all of the people in the group are accused of murdering someone. They have all escaped punishment for their crimes. The group quickly panics and tries to find out who the killer is. In the mean time, they are slowly killed off - one by one in accordance with the "10 Little Indians" nursery rhyme that is displayed all throughout the house. The group becomes more and more afraid of being alone and sure that one among them is the killer. This was a pretty good book. Believe it or not, I have never read an Agatha Christie book before. I did enjoy this book. It took me awhile to get used to the writing -since it was written in the 30s. It was a quick read, and pretty entertaining. Lots of "! ", which I found funny. My husband is always yelling at me for my over use of those, but yet here is one of the most famous writers of all time using them constantly. I would recommend it. It isn't very scary - probably because it was written in the 30s - it doesn't compare to scary today. But it did leave you wondering who the killer was. And when it is revealed, you definitely didn't see it coming. This is a story about Shane Burcaw - the author - who has Spinal Muscular Atrophy (SMA). 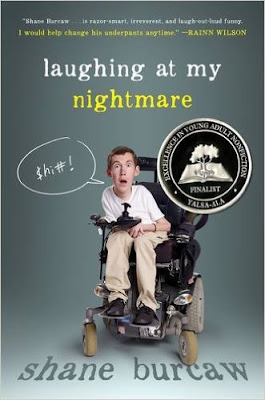 At the time of the book he is 21 years old and has been confined to a wheelchair since the age of 3. He covers issues that are related to the every day teen/young adult, but also talks about what it is like to have a life threatening disease. Shane loves sports, video games, and hanging with his friends. He talks light heartedly about dealing with everyday issues from a wheelchair and how it affects him as his condition worsens. He reminds us that it is not worth making mountains out of molehills - especially with situations that are not in our control. I enjoyed this book. It was definitely written by a young adult male - lots of bathroom humor and crude language. But it didn't distract from the message of the book and the story he had to tell. You don't often seen people who are in their 20s and still alive with SMA. It was interesting to hear about the disease from his perspective. The book was written a few years ago, and I did look up his blog, and he is still doing well. Still living a full life with his limited time remaining. Good message for us all. Another one I missed reviewing! At least I am catching up. You know you are excited. 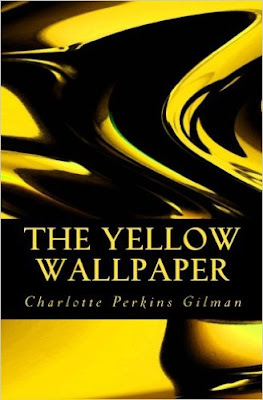 Today's book is "Yellow Wallpaper"
This book was written by a woman who was depressed and sent to the country to rest. The woman wants to be a writer, but her husband and doctor feel that she just needs to rest and relax so that she can get back home to her children. But instead of resting, she is confined to a room in a house with "hideous" yellow wallpaper where she descends into madness. This is a very short book that was originally written in 1892. It captivates a "rest cure" that doctors used to prescribed to women who seemed to be depressed after childbirth. This woman sinks to insanity and blames most of it one the yellow wallpaper in her room. She starts to hallucinate that there are people in the wallpaper that are trying to get her. This book is a good depiction of depression and how it can be misdiagnosed and mismanaged. It was a quick read, and an interesting one at that, so check it out. The World According to Humphrey. I read this one a while ago to the kids, but didn't realize I forgot to write about it. 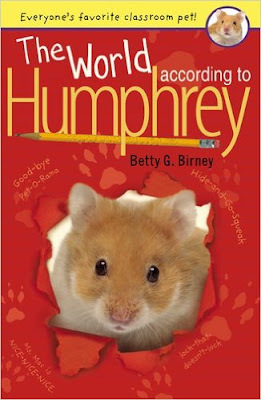 This is a book (Well quite an extensive series, really) about a little classroom hamster named Humphrey. He is in a classroom of second graders. He loves school, and gets to spend his weekends with a different student each time. 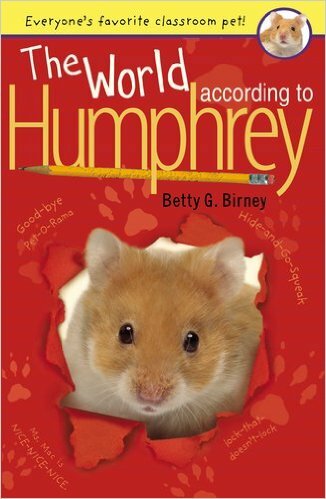 In the night, after all the kids have gone home, is when Humphrey has all of his adventures. He has a "lock that doesn't lock" on his cage that allows him to get out and explore. He keeps a little notebook and pencil behind the mirror in his cage so that he can learn along with the students. He helps the kids in his class when he can - always looking out for others. This series is really cute. My two 10 year olds have had me read every single one of these Humphrey books to them. They have good lessons about friendship, family life, classroom behavior. And who can resist a cute little hamster. If you have little ones, definitely check out this series. They will love it. This is the story of Ella of Frell who was given a gift at birth - the gift that she will always be obedient. It was a gift from a foolish fairy. 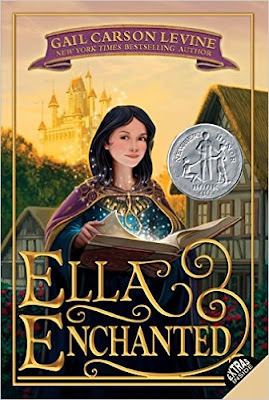 For Ella's whole life, she has always had to do what people tell her to do, and if she doesn't she gets physically ill. When she is nearly grown, she goes on a quest to find the fairy who gave her this curse. This story is a silly one. 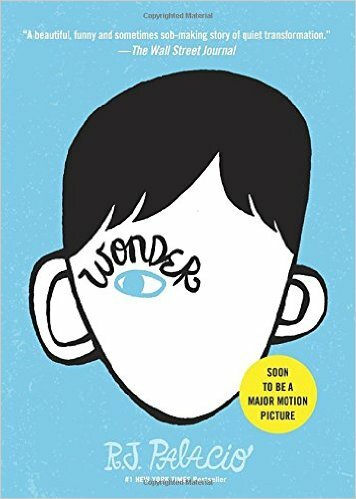 It is definitely a book for 3rd-4th graders. It is a version of Cinderella - her mother dies, his father married an "evil stepmother" who comes with two daughters of her own, and she meets a prince that she falls for. The differences are great, though (no talking mice) but the premise is the same. It is a cute book. Younger kids will love it. This is the story of 16 year old Phillip Hutton. He is half Chinese, half English and from a prominent family in Penang. While his siblings and father are away on vacation, he chooses to stay home alone. He gets to know Hayato Endo who is a Japanese diplomat. Philip spends time showing Endo around and in return Endo teaches him Japanese and aikido. When the Japanese invade Malaya, Phillip learns that Endo is a Japanese spy. It is clear that Endo has taught Philip aikido to help save his life and possibly the life of his family. This is a pretty good book. I have to admit I had a hard time getting into it. I don't think it was the book's fault, though. I think it was when I was trying to read it, so I don't want to judge it too harshly. I did like the characters. Endo-san and Phillip develop almost a father/son relationship. Since Phillip's mother had died when he was a baby, and she was his Chinese ancestor, he never felt as close to his father and half siblings. This book does a good job mixing the three cultures together - Western, Chinese, and Japanese. I have read a lot of WWII books/pre-WWII books, but this is the first one from Southeast Asia. I recommend trying it out. This is the story of a woman named Henrietta Lacks. The world of science knows her only as HeLa. She was a poor tobacco farmer who died of a cancerous tumor in the 1950s. Before she died, doctors took a sample of her tumor into the labs at Johns Hopkins and for the first time ever, had cells that multiplied instead of perished. Her cells are used all over the world still today for vaccines, medicine, cloning, gene mapping, and more. There are billions of her cells all over the world that were sold for research, yet it was without Henrietta's knowledge or her families knowledge. 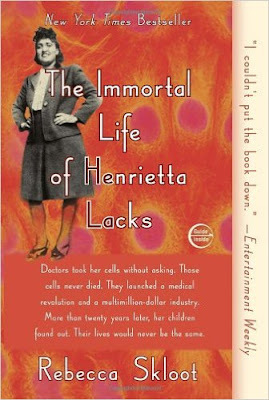 This book was written to introduce the world to Henrietta and her family so that we could learn more about the person who changed the face of medicine. 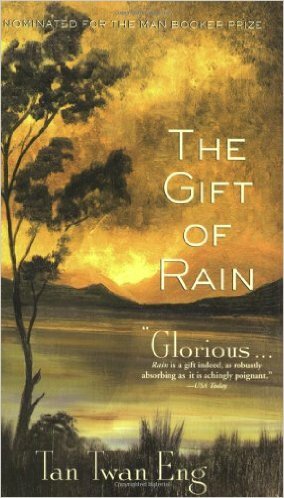 This was a fabulous book. My husband is a geneticist and went to Johns Hopkins medical school. 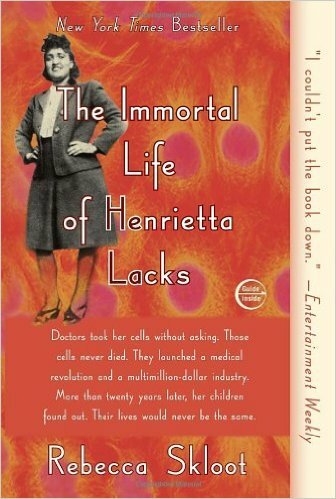 There they used and learned about HeLa cells on a regular basis, but were never told of the woman behind the cells. The woman who wrote this book did years of research to track down the family, and the doctors and the researchers who were involved in the initial removal of Henrietta's tumor. Henrietta's family was very angry that this all happened and yet they could not even get health insurance. They never saw any money related to these cells, and felt that Henrietta was violated because they were taken without her knowledge. The author of the book spent years breaking into the family and getting them to talk to her, and getting them to trust her that she was trying to find out the truth about Henrietta and what happened with her cells. The author spends most of her time with Henrietta's daughter - taking her a long for many of her investigations so that she can discover things about her mother she never knew. The story was wonderful, and the author taking the time to find out about the person behind the cells was even more wonderful. I am so glad I got to read about it. I hope these days that the scientist are explaining where HeLa came from and the person she was. This is the story of August Pullman who is a 10 year old boy with a facial deformity. He has never been in public school, but by the time he is ready for 5th grade, his parents feel it is time for him to get out into the world and make friends his own age. Even though he is used to people staring at him and keeping their distance, he isn't prepared for the reactions of many of the kids at his new school. Soon, though, he makes a nice set of friends that see August for who he is - beyond his physical appearance. His friendships grow and soon almost every kid in school sees themselves as a friend of August. They see him for the person he is - not based on his physical appearance. I really liked this book. It is a favorite of my 13 year old daughter, and she encouraged me to read it. I think it sends a great message about acceptance and seeing beyond the outside of a person. It teaches kids that it is okay to ask questions but to always choose kindness. If the kids in August's school never approached him, they would never have found out what a funny, kind, smart kid he is. I would love to see this book read in classrooms across middle schools. In a time where kids see so much negativity among adults and in the news, it would be nice for them to be reminded to be kind. I would bet you thought I gave up on this blog. The start of the school year has been madness, and even though I am reading regularly, I did not have time to sit and blog. But today I have decided it is time to catch up. My guess is that most of you have seen this movie. 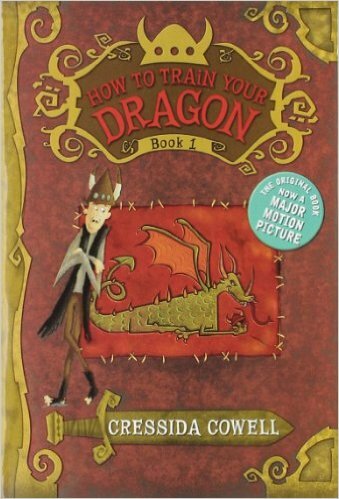 It is a favorite in our house, and the book wasn't like the movie in many aspects. Considering it came out about 4 years before the movie, I am not surprised. This is the story of a Viking named Hiccup. (for reals). He is nothing like his "Head of the Clan" father because Hiccup is scrawny and not very brave. His job is to find a dragon to train and he finds one as scrawny as he is, and names him Toothless. (if you have seen the movie, you would know that Toothless is anything but scrawny). Hiccup has unusual techniques that he uses to train dragons and in the end, he and Toothless become the heroes of the story. I liked this book. Because I saw the movie first, it was a bit weird because it really was very little like the movie. There were so many things that happened in the book (a large challenge among the youngest Vikings) that never happened in the movie, you really needed to view it as a completely different story. I read this with my 9 year old son and we both enjoyed it. I would recommend it for the 8-11 year old range.